A couple walk down Mermaid Street. 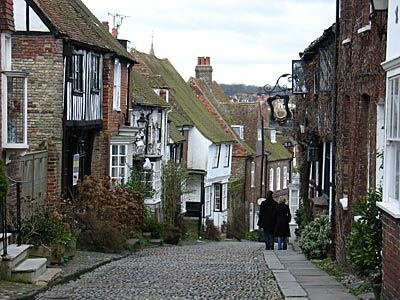 To the right you can see the 15th century Mermaid Inn. Originally built of wattle, daub and plaster, it was destroyed during the French raid on the town. The pub retains its Norman cellar cut from rock with a barrel vaulted ceiling of ships' timbers and Sussex oak.